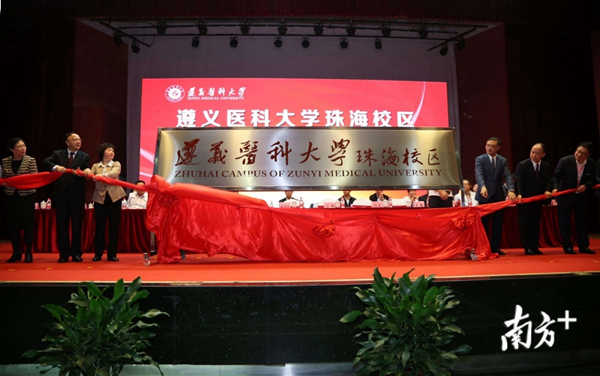 Zunyi Medical College Zhuhai became a "university" on March 31 at the same time the main campus in Guizhou Province partnered with Zhuhai Yunkang Health Industry Group in Hengqin. The changes were made during a conference at the ZMU Zhuhai Campus in Jinwan District. As the college campus (遵义医学院 Zūnyì Yīxué Yuàn) became Zunyi Medical University (遵义医科大学Zūnyì Yīkē Dàxué), so did the medical college hospital become the 5th Affiliated Hospital of Zunyi Medical University, Zhuhai. The conference agenda covered higher medical education and health development and included forums about nursing education and biomedical science. In that context, YunKang agreed to cooperate with Zunyi Medical University in education, R&D, and industrial applications. Yunkang Group has established talent-training bases with Guangxi Medical University and cooperated with institutions in Guangzhou, Beijing, Shanghai, Hong Kong, and elsewhere "to jointly develop high-quality talents, industry-university-research cooperation, and service society." A growing number of medical associations rely on Yunkang technology and operations with its network providing professional medical and health services to institutions at all levels, according to Yunkanghealth.com. Zhuhai Deputy Mayor Yan Wu said at the conference that the interactive development has broad prospects. Also attending were Wu Qingshan, deputy director of the Standing Committee of the Municipal People's Congress, and other local leaders. Formerly known as Dalian Medical University, Zunyi Medical University was established in 1947. It moved to Zunyi City in northern Guizhou in 1969 to become a prestigious multi-disciplinary and multi-specialty facility. Its second campus was built on Yelin Avenue in Doumen District in 2001. The 5th Affiliated Hospital of Zunyi Medical College, Zhuhai, was founded in 2003 on the foundation of Doumen People's Hospital. It has become a modern comprehensive third-grade clinical and educational hospital integrating teaching, scientific research, and disease prevention, treatment, and cure.